After another happily uneventful border crossing into Germany we set our sights on one of the more structurally impressive sights in the Brandenburg countryside. 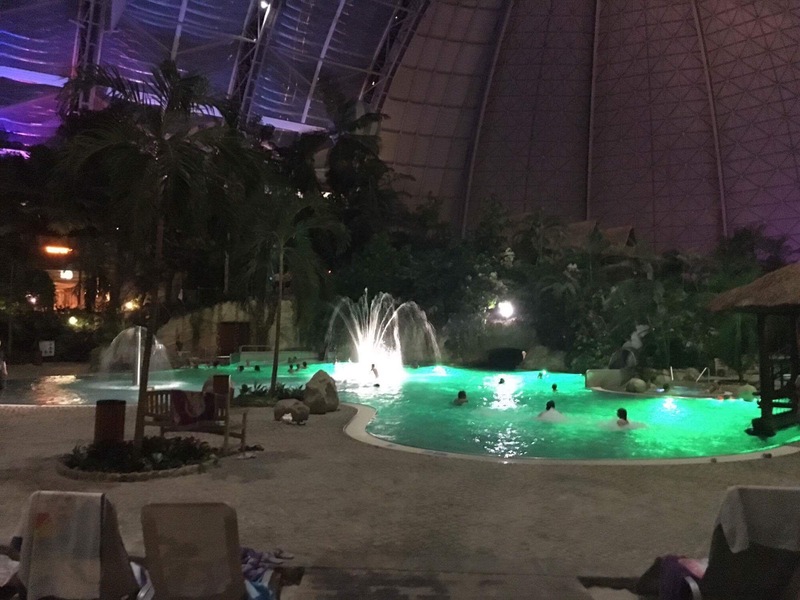 The Aerium in the former Brand Briesen Airfield was once the sight of Zeppelin constructions in the second world war, and later a soviet military base, before becoming the fascinating Tropical Paradise it is now. For the last decade the Aerium has welcomed hundreds of thousands of visitors into the captivating climate that is alien to the rest of Germany, where the hangar boasts the largest indoor beach in the world, alongside a host of foreign lagoons, pools and slides. As intriguing a spectacle the tropical- military themed water park is, the history of the colossus is just as noteworthy. Originally created to serve the Luftwaffe in 1938, the airfield was overrun by the red army in 1945, who’s possession it remained in until 1992 after the reunification of Germany. The government then sold the space to airship manufacturer Cargolifter who built the behemoth of a hall which is the biggest free-standing hall in the world and the fourth largest usable volume on the planet. It remained an industrial monster until Cargolifter went bankrupt in 2002, after which it was transformed into the staggering recreational centre it is now, which opened its doors in 2004. Knowing nothing of its existence before the beginning of summer, we were delighted to find out that our route wasn’t too far away from Tropical Paradise after discovering the hidden gem on Facebook. It was one of the typical travel videos that labelled it a hidden ‘must see’, accompanied by the usual relaxed house music, montage of drone footage and clips of people over enjoying a puddle that instantly sold us and it was quickly added to the tour’s itinerary. The outstanding contrast of the cultivated German countryside and the exotic interior of the hangar made walking through the doors feel like stepping into a different country rather than into the threshold of a redeveloped construction hall, and the four us rapidly discovered our inner eight-year-old. Splashing about in the lagoons, flying down the slides and running around the wild tropics, we were quickly lost in a different world to the military surroundings and enraptured by the amalgamation of Typhoon Lagoon and the Eden Project. As captivating as the interior of the aerodrome was, it was the outside amusements that were the most fun, particularly the rapids on which we enjoyed many a race down. Starting as a harmless competition, the races unavoidably became battles to the finish line, featuring drowning, wrestling and a lot of unsportsmanlike behaviour. However, the most memorable incident of the day didn’t involve slides or pools but the most unbelievable game off odds I’ve ever witnessed. Odds is basically an extreme game of dares for those unfamiliar with the concept, where if you both say the same number on the count of three, the challenged participant must do the dare asked of them. So, as we indulged in our lunch Charlie asked of Bani what the odds of him physically assaulting then racially abusing a fellow tourist, to which the odds of 4000/1 were unveiled. People rarely get caught on a 1 in 10 chance so you can imagine our ecstatic adulation when both of the guys said 64 in perfect synchronisation. 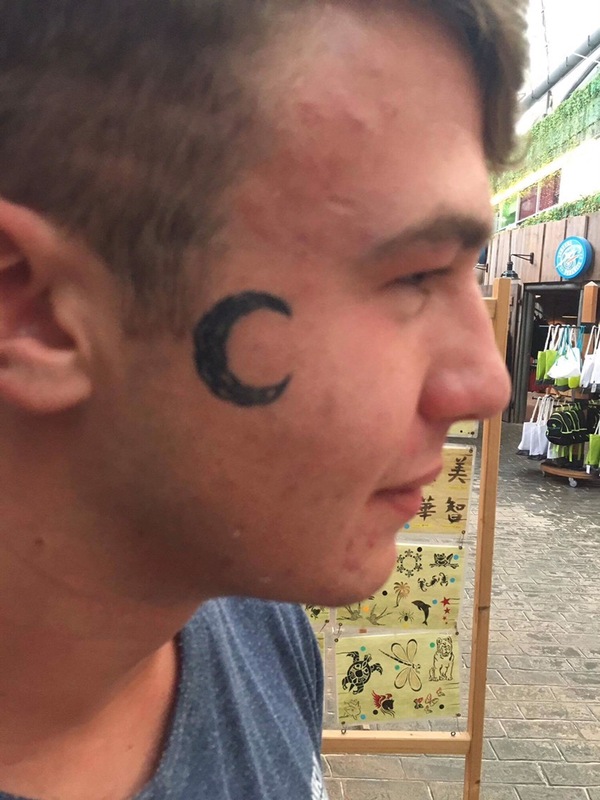 Obviously, we couldn’t allow such an ordeal to occur so a fitting punishment was decided upon and Bani was sent to the child’s stick on tattoo parlour to receive his Mike Tyson themed face decoration. Mates being mates, we quickly lost him in the midst of the family park, stumbling around, alone, with a peculiar tattoo on his cheek looking extremely suspicious. With all the fun and games of exploring the unique Aerium completed we set up camp for the night in the carpark, after being shunted around the campus by the security for a while. This is the first time I’d ever attempted to bundle four people in the van for the night and it wasn’t the most comfortable slumber ever experienced. With a pair on the bed, one person across the front seats and the final person curled up on the floor spooning the old gear box it wasn’t the most glorious of set ups- but at least there was a clear night sky to soothe us. We spent the morning of the next day having a look round the rest of the airfield, which was in a much sorer state then the grand Aerium. Aircraft hangars and run ways have been left seemingly untouched since the end of the soviet ownership, who had expanded the air field by extending the runway and building all the hardened aircraft shelters, all of which now seemed like a ghost land. We delved into the creepy remains and searched the naturally overran buildings which had mostly been gutted and stripped of any thing interesting, other than the remnants of people who had attempted to make the shelters their temporary homes. The whole area surrounding the theme park was interesting but one day was enough to see all there was to see so we continued our journey further into Germany towards the capital, where we were heading to more friends, more history and more big nights (including my birthday). Thanks for the like on my eclipse post! When I clicked over here to see just who the Campervanman was, I was delighted to see your VW van. My husband is a VW camper enthusiast; we covered many, many miles (MN to Mexico once and multiple trips MN to the FL Keys) in our 1966 camper after our earlier one (a split windshield safari van) was destroyed in a garage fire. Your European adventure sounds like the ultimate youthful summer adventure — I wish you safe drives and following winds on your travels. Thanks for the kind words! It’s great to hear from someone with a similar passion for vw’s. Your split screen sounds amazing and a trip in America in a van is top of my bucket list.